Somewhat forgotten in the last few months have been my thoughts on Brasília, which I visited all the way back in March. For such an incredible experience it seems remiss not to record my thoughts before they fade into distant memory. I’ve written separately about my architectural impression of the city, but here is a brief summary of the three days I spent there. In retrospect it’s funny to think how nervous I was prior to visiting Brasília, especially as it’s one Brazil’s safer cities. Yet this anxiety meant I had my eyes open as the plane touched down upon the alluring deep red soil seemingly so common in Brazil. My first task at the airport was to recover my lost baggage from TAM staff who couldn’t speak any English. Once again I was found to be shamefully arrogant in thinking I could get away without learning Portuguese, but thankful I was helped by a young girl who knew enough English for the conversation to have a successful conclusion. I arrived at the hotel just a day after the state visit of President Obama, meaning much of my route was decorated with flags in the colours of Brazil and the United States. I’d be lying if I said I didn’t pretend these were rolled out for me! With no clean clothes and a dead camera battery, my first full day in Brasília wasn’t to be spent hunting for good photo opportunities but familiarisation with the city and the language. Soon enough, upon visiting the museum I was able to conduct a small conversation in Portuguese, and the rudimentary nature of my language skills somehow saw me gain access into the corridors of power at the National Congress. I’m not actually sure if the public are allowed into the part of the building I found myself, but my brother later told me that many Brazilians believe that if you speak English you’re probably important enough to be there! Armed with clean clothes and a fully charged camera, I bravely ventured into the city again the next day. My first stop was the Television Tower. Surrounded by an outdoor market and in a delaparated condition, this felt like a risky proposition, and stepping on to the 75m-high observation platform saw no end to my nerves. However it did provide fantastic views across this planned city. Looking west, I spotted the distinctive JK Memorial. I decided to get there next on foot, although walking is definitely not recommended in a city built around the car. The memorial to Juscelino Kubitschek, whose idea it was to build this city, gave me my first taste of the futuristic architecture Brasília is renowned for; this building could easily have been mistaken for a secret hideout for a James Bond villain. The breathtaking interior of Santuário Dom Bosco. The Catedral Metropolitana often gets the most attention, but on reading about Santuário Dom Bosco I knew this would be too good to miss. 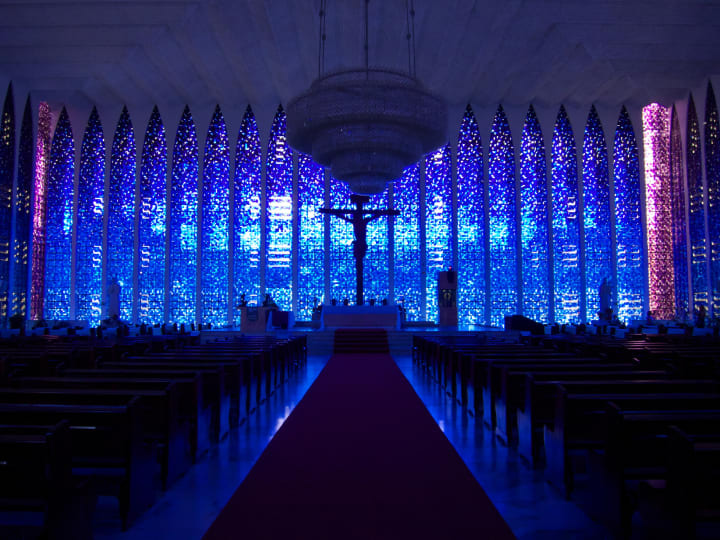 Strikingly simple from the outside; a large square building covered in beautiful blue and purple stained glass, its interior — adorned with a large central hanging chandelier — left me entirely breathless. This may be the most impressive building I’ve ever seen. However, I couldn’t come all this way without visiting Brasília’s more famous landmarks, and seeing the Museum, Cathedral and Praça dos Três Poderes (Three Powers Square) at close quarters meant I was able to get a better sense of a city. Often written about in utopian terms, I arrived expecting to find a clean yet lifeless city. Instead I discovered a remarkably lively and fascinating metropolis baring little resembalance to the idealised depictions I had read about. Clearly this is a city from a different age, albeit one that failed to realise the dreams of its founders (whilst the city is safe there are many satellite towns which you are advised not to visit). In many ways I wished I had visited the city that I had read about; I hoped to find utopia but instead found a distinctive city struggling to grow beyond its idealistic plans.